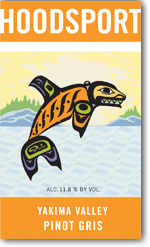 The "Orca Series" wines are; 2007 Cabernet Sauvignon, 2008 Pinot Gris, 2006 Cabernet Merlot, 2007 Chardonnay and 2007 Merlot. 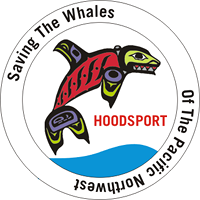 A portion of the proceeds, from the sale of Hoodsport Orca series wines, benefit orcanetwork.org. The Orca Network along with Hoodsport Winery will host a series of promotions and educational seminars that will be used to highlight the plight of the Puget Sound Orca community and raise funds for the Orca Network. These wines can be purchased online or at the winery. In addition the wines are available at some local grocery or WSLCB stores. For help in finding the wines or in placing an order call 1-800-580-9894. HOODSPORT WINERY is located on the rural Olympic Peninsula in Washington State. Our view is of the Hood Canal where we have the opportunity to view Orca's. Recently, Pods of Orca's are frequent visitors to our part of the world. The artwork on this bottle is a tribute to the native people and wildlife indigenous to our region. 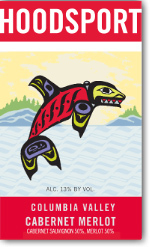 The whale on the front label is an adaptation of Orca the creation of artist Clarence Mills, a member of the Haida Nation of British Columbia. Technical Notes: The grapes for the Hoodsport Cabernet/Merlot came from the Roza Hills Vineyard. They were harvested between September 20th and November 2nd with the following average analyses: Brix 25.5 TA .58, pH 3.90. The Grapes were crushed and destemmed into stainless steel tanks leaving 30% whole berries. After a 24 hour cold soak, the grapes were inoculated with Prem. Cuvee and Pasteur Red wine yeasts. The Grapes Fermented on their skins for two weeks, with a 15 minute pump over twice a day. Once the must had extracted the right amount of flavor, color and tannin the tanks were pressed off and finished fermentation in stainless steel tanks. Once the primary fermentation was complete, the wine was inoculated with ML starter. After completing this secondary ML fermentation, the wines were racked and SO2 adjusted. The Cabernet and Merlot wines were blended, lightly oaked, egg white fined, filtered and bottled. This is a bright and lively white wine offers fresh aromas and flavors of melon & apricot, try with chicken, fish or seafood dishes. Technical Notes: The Pinot Gris grapes, from a high elevation Yakima Valley AVA vineyard, were picked October 18, 2008. Brix at harvest was 21.5, TA was .77 g/100 ml, and pH was 3.30. The grapes were whole bunch pressed and treated with Scottzyme Cinn-Free to help release varietal aromas and aid pressing. A slow, cool fermentation after inoculation with VL 1 yeast followed, with an average fermentation temperature of 54°F. Fermentation was stopped with a residual sugar of .8% (8 grams/L). The wine was protein stabilized with bentonite and sterile filtered before bottling. Technical Notes:The grapes for the 2005 Hoodsport Cabernet came from the Roza Hills Vineyard. They were harvested between October 15th and November 2nd with the following average analyses: Brix 25.0, TA .52, pH 3.90. The Grapes were crushed and destemmed into stainless steel tanks leaving 30% whole berries. After a 24 hour cold soak, the grapes were inoculated with Prem. Cuvee and Pasteur Red wine yeasts. The Grapes Fermented on their skins for two weeks, with a 15 minute pump over twice a day. Technical Notes: We harvested the grapes for the 2005 Hoods Port Chardonnay from the Roza Hills Vineyard on September 16-17th. The analysis for brix at harvest was 23.1, a T.A. of .7 and a PH of 3.63. The Chardonnay was crushed and destemmed leaving 20% whole berries. We then cold settled the juice for 4 days before it was racked off of its juice solids. We cold fermented this wine for four weeks using Epernay-II wine yeast. Once fermented, we racked the wine off of its solids, heat and cold stabilized before filtering. Dessert served with dinner. Pull the cork and you've opened a beautiful treat best served with barbequed ribs, pasta with marinara sauce, or swordfish or tuna a wine you'll find really compliments those foods and more; This red is never afraid to join you on the couch to ask what you want for dinner. Aromas of plum, berries, cherries and a subtle splash of liquorish pop from the glass with every pour. It'll make you hungry for another bite of food along with one more sip if only to enjoy the warm tingle of clove just behind your tongue. Now, let's talk about chocolates or a slice of cold pizza. Technical Notes: The grapes for the Hoodsport Merlot came from the Roza Hills Vineyard. They were harvested between September 20th and October 5th with the following average analyses: Brix 25.0, TA .52, pH 3.90. The Grapes were crushed and destemmed into stainless steel tanks leaving 30% whole berries. After a 24 hour cold soak, the grapes were inoculated with Prem. Cuvee and Pasteur Red wine yeasts. The Grapes Fermented on their skins for two weeks, with a 15 minute pump over twice a day. Once the must had extracted the right amount of color and tannin the tanks were pressed off and finished fermentation in stainless steel tanks. Once the primary fermentation was complete, the wine was inoculated with ML starter. After completing this secondary ML fermentation, the wine was racked and SO2 adjusted. The wine was lightly oaked and blended with 1% Cabernet to create the final blend. Prior to bottling, the Merlot blend was egg white fined and filtered.